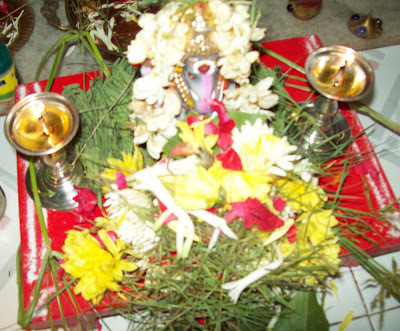 During the festival,a household worships an idol of Ganesha. The worship happens for one day in South India.We get up early in the morning, sanctify ourselves, the house and the puja area where we will be installing the Ganesh idol/murti. The puja begins with Invocation of Lord Ganesha( Avahanam.On this day we offer different kinds of fruits, 21 types of patri including durva (Sanskrit word for 21 different variety of leaves) to God Ganesh. We first do puja for turmeric Ganapati (manjal pilayar)and then to the idol.. Ganapathi ashtotaram (108 names) is the usual mantra for the Archanai. Even 1008 names ( Sahasranaamam) can be chanted for the puja. Neivedyam or offerring is always a variety of Kozhukattais! 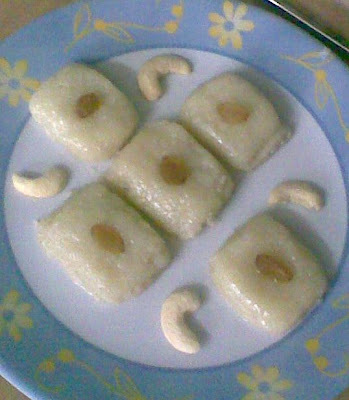 The main sweet dish during the period are Kozhakattai, Sweet KozhukattaiKara Kozhukattai, Sundal and Payasam Appam are the traditional offerings to Lord Ganesha in South India. 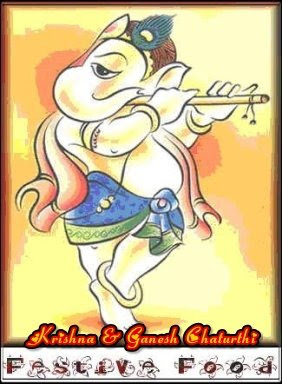 And we ate the prasadam, shared with our friends and in the evening perfomed aarathi and chanted few slokhas of Lord Ganesha and did nimarjana/visarjan (immersion) of God Ganesha in the late eveningor next day morning. The pal cake is a South Indian sweetmeat that takes you to sweet heaven. Though I have been baking for some years now, I have never given our traditional cakes a try. These are the ones that my mom, and my mother in law turn out the perfect little squares during festivals, in a moment These can be made with just milk and sugar - called 'paal cake. South Indian cakes need no baking.With Sugar, milk You can make this for any festivals, prasadam, neivedyam, weddings, and it is sure to be a hit. If you need larger quantities, make this in batches. In a heavy bottomed pan heat 1 table spoon ghee on a medium flame and fry the rava till it turns whitish. Add the milk and allow to boil on a low flame. Then Add sugar and keep cooking on a medium to low flame, stirring continuously. Keep stirring constantly so that it does not stick to the vessel. Once the sugar is dissolved start adding ghee little by little. When it reaches a thick consistency say in about 15 minutes add the remaining ghee and keep stirring. Once the cake leaves the bottom of the vessel it will be ready for pouring on to a greased tray. The right time would be to check the sides of the pan for white powder. Pour it in a greased tray and let it cool for some time. Then cut it in desired shapes. new 2 me... thxs for shar.. The sweet burfi looks very simple to make. Have a blessed festival. How cute! They look lovely. Think it would be okay if I try with skim milk? Pal cake looks really delicious and lip smacking. Lovely information on Durva. Thank you for the wonderful entry. Thank you priti due to network problem i cant able topost . Thanks divya for visiting my blog for lovely comments. Thank you Purva yes, you can use my pooja picture for the round up. the pic is mouth watering! nice recipe!